the attachment icon, if attachments are defined. 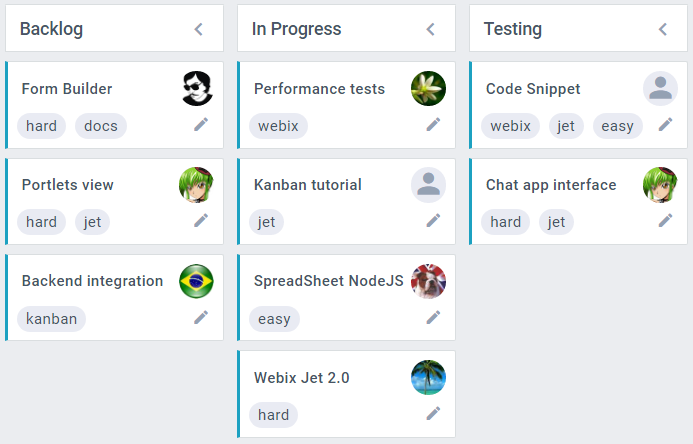 You can place different HTML-elements onto cards of the Kanban Board. 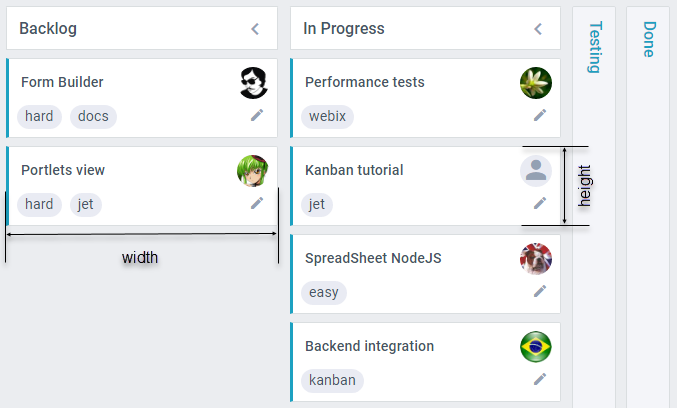 Each KanbanList allows configuring dimensions and templates of its items. It is implemented in the type of KanbanList. 'templateAvatar' - the template for an item avatar (the photo of an assignee or an icon for assignees without a photo). A template can be specified either as a string or as a function. Below you will find the description of all available templates. If there is space not taken by KanbanLists, the right side of Kanban will remain empty. If the space available for Kanban is not enough for all lists, you can wrap Kanban into ScrollView. You can read more about KanbanList here. Specifies the height of an item in the list. The 'height' property as well as 'width' can be defined as a fixed value. Defines the inner HTML for each card. The default definition of this property applies other templates: icons, text, avatar. var color = kanban.getColors().exists(obj.color) ? var attachments = kanban.config.attachments ? (color ? " style='border-left-color:" + color + "'" : "") + ">"
When you redefine the main template, the result is fully up to you. Do not forget to pass the kanban object to the templates you need (e.g. 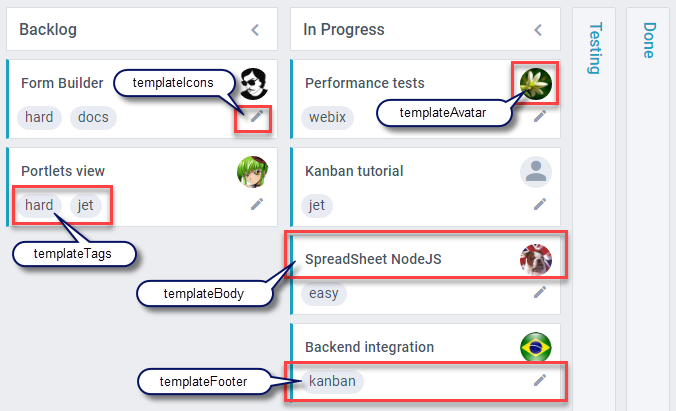 templateAvatar(obj,common,kanban)). Defines the main content of items. By default, it displays the card title (text). Sets an array of icons for Kanban Board. click - the onClick event handler for the icon. Defines how the icons look. Note that in Kanban 6.1 tagDelimiter has been moved out of the common configuration to kanban.config.delimiter. Defines the content below the item body, displays the item tags and icons.